I went to the opening of Madonna Del Rosario last week at Artisan, a collection of objects and jewellery inspired by the rosary. Love a good religious theme I do! There’s some interesting work in this show, but the opening was so jam packed I only got the briefest of looks at everything. So I’ll have to get back in for a quieter look another time. 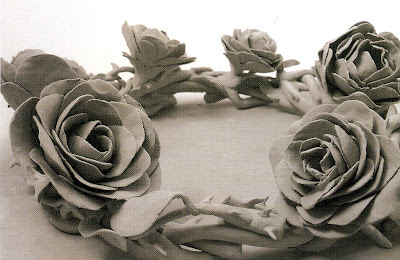 A few pieces particularly caught my eye though - Gerry Wedd’s crown of roses (image above), Julia Moretti's giant rosary made from uncooked pasta shells, Madeline Brown’s beautifully “tatted” rosary, and local ceramicist Ky Curran’s Madonna tile installation…definitely worth a look if you're in the neighbourhood.